Do I cause global warming, climate change and their related harms when I go for a leisure drive with my gas-guzzling car? The current verdict seems to be that I do not; the emissions produced by my drive are much too insignificant to make a difference for the occurrence of global warming and its related harms. I argue that our verdict on this issue depends on what we mean by ‘causation’. If we for instance assume a simple counterfactual analysis of causation according to which ‘C causes E’ means ‘if C had not occurred, E would not have occurred’, we must conclude that a single drive does not cause global warming. However, this analysis of causation is well-known for giving counterintuitive results in some important cases. If we instead adopt Lewis’s (2000) analysis of causation, it turns out that it is indeterminate whether I cause global warming (etc.) when I go for a single drive. Still, in contexts where we seek to control or understand global warming, there is a pressure to adopt a more fragile view of this event. When we adopt such a view, it turns out that a single drive does cause global warming (etc.). This means that we cannot like Sinnott-Armstrong (2005) and Kingston and Sinnott-Armstrong (2018) reject the idea that I should refrain from going for a leisure drive simply because such a drive does not cause global warming. If I go for a leisure drive with my gas-guzzling car, am I then causing global warming and its related harms? In “It’s not my fault: Global Warming and Individual Moral Obligations” (2005) Walter Sinnott-Armstrong makes the case that I do not. This is the claim I question in this paper. Sinnott-Armstrong’s paper has been extensively discussed, (for instance by Braham and Van Hees 2012; Hiller 2011; Hourdequin 2010; Jamieson 2007, 2014; Maltais 2013; Nolt 2011; Sandberg 2011; Schwenkenbecher 2014; Zoller 2015), but a recent reply by Sinnott-Armstrong written together with Ewan Kingston (Kingston and Sinnott-Armstrong 2018) makes it obvious that there is more to say about the argument that a leisure drive does not cause global warming and its related harms. Joyguzzling: Some people drive to their jobs or to the store because they have no other reasonable way to work and eat. I want to avoid issues about whether these goals justify driving, so I will focus on a case where nothing so important is gained. I will consider driving for fun on a beautiful Sunday afternoon. My drive is not necessary to cure depression or calm aggressive impulses. All that is gained is pleasure: Ah, the feel of wind in your hair! The views! How spectacular! Of course, you could drive a fuel-efficient hybrid car. But fuel-efficient cars have less ‘get up and go.’ So let us consider a gas-guzzling sport utility vehicle. Ah, the feeling of power! The excitement! […] Do we have a moral obligation not to drive in such circumstances? Sinnott-Armstrong’s (2005) main thesis is that there is no moral obligation to refrain from going for such a drive. To establish this thesis, he considers quite a few general moral principles that might seem to support this thesis, and argues that upon closer inspection, none of these principles support the claim that there is such an obligation. He continues this pursuit in the later paper co-written with Kingston, which is an extension of Sinnott-Armstrong’s previous paper. This principle, he argues, does not entail that we have a moral obligation to refrain from joyguzzling since such an act does not cause harm to others. As he puts it: “the point is simply that my individual joyride does not cause global warming, climate change, or any of their resulting harms” (Sinnott-Armstrong 2005: 299). Kingston and Sinnott-Armstrong (2018) repeat this claim. This is the claim I dispute in this paper. I do not consider whether we have a moral obligation to refrain from going for a leisure drive, but simply whether such a drive causes global warming, climate change or their related harms. Still, if my arguments in this paper are sound, Sinnott-Armstrong & Kingston have not succeeded in ruling out that we might have a moral obligation not to joyguzzle. I do not cause climate change related harm, Sinnott-Armstrong argues in the original paper, for the following reasons: (I) my act is neither necessary nor sufficient for climate change related harm to occur; emissions of greenhouse gases are perfectly fine in small quantities; they do not cause harm, not even imperceptible harm, and (II) there is no reason to single out my leisure drive out of all the other background conditions and identify it as a cause of climate change related harm. In the more recent paper, Kingston and Sinnott-Armstrong elaborate the first argument and argue (Ia) that individual drives do not cause climate change induced harm since climate change is a result of global warming, and global warming is an emerging phenomenon; and (Ib) that the only difference (if any) an individual leisure drive makes is that climate change related harm would occur a fraction of a second earlier than it otherwise would. I will argue that (I) and (II) most likely are mistaken. If we assume simple, (I) could be restated along these lines: a single leisure drive causes global warming if and only if global warming would not have occurred had I refrained from going for this drive; this is obviously false, and therefore a single leisure drive does not cause global warming. The same reasoning would apply to the questions of whether a leisure drive causes climate change or climate change related harm. Even though my main target in this paper is Kingston & Sinnott-Armstrong’s claim that a single drive does not cause global warming, the arguments I present (if correct) entail that Jamieson is incorrect in claiming that there are no act consequentialist grounds for why we should refrain from going for a leisure drive. These arguments also encourage us to elaborate the individual difference principle in a direction that might, in the end, entail that I am on causal grounds accountable for harm even if what I have done made no difference for that harm’s occurrence. The point becomes clearer if we distinguish global warming from climate change. You might think that my driving on Sunday raises the temperature of the globe by an infinitesimal amount. I doubt that, but, even if it does, my exhaust on that Sunday does not cause any climate change at all. No storms or floods or droughts or heat waves can be traced to my individual act of driving. It is these climate changes that cause harms to people. Global warming by itself causes no harm without climate change. Hence, since my individual act of driving on that one Sunday does not cause any climate change, it causes no harm to anyone. To give an outline of the paper, I will begin by arguing that (I) is mistaken since it relies on simple, a principle that is known to give counterintuitive results in cases of overdetermination and pre-emption (I do this in section one). Further, in section two through four, I will consider a few alternative strategies that might seem to entail that a single drive causes global warming, but that are not fully successful in establishing this upon closer scrutiny. In section two, I argue that an appeal to expected utility would not entail that we have a moral obligation to refrain from joyguzzling. As long as we stay with assuming simple, the expected climate change related utility of a single drive is zero (disregarding butterfly effects). In this, I side with Kingston & Sinnott-Armstrong. In section three, I will consider appeals to group causation. I will argue that even if we grant that the group of people driving do cause global warming, it is far from clear what implications this has for the individual driver. In addition, it is far from clear that the group of drivers causes global warming (etc.) given simple. In section four, I will consider Kingston & Sinnott-Armstrong’s argument for why a NESS-condition for causation would not entail that a single leisure drive causes global warming. I argue that while their argument is mistaken, their conclusion is correct. In section five, I will suggest that we should assume Lewis’ elaborated counterfactual analysis of causation, which roughly states that an event C causes another event E when differences in how, when and if C occurs make enough of a difference for how, when and if E occurs. One reason for suggesting this is that this analysis can handle most problematic cases of pre-emption and overdetermination. However, the elaborated counterfactual analysis does not determinately entail that a single drive causes global warming. Instead, it entails that it is indeterminate whether such a drive causes global warming. It is indeterminate since it is unclear when a single drive makes enough of a difference for how and when global warming occurs. I also consider some circumstances under which we have reasons to think that also minuscule differences in how and when global warming occurs matters. In section six, I will argue that Lewis’ elaborated counterfactual analysis straightforwardly refutes the argument (Ib). If a single drive does make a small difference for when global warming occurs, it is indeterminate whether this drive causes global warming (since it is indeterminate whether this difference is large enough). I also argue that (Ia) most likely is mistaken on physical grounds. The ability of greenhouse gases to absorb and re-emit photons is not an emergent property. In section seven, I will consider the possibility that even if a single drive causes global warming and climate change (given Lewis’ elaborate analysis), and even if global warming and climate change in turn cause climate change related harm, it is not obvious that a single drive will cause climate change related harm. Still, I argue, that since causation on Lewis’ account is transitive, a single drive does cause climate change related harm in such circumstances. Moreover, it is far from sure that the emissions from a single drive never make some tiny difference for how, when and if climate change related harm occurs. Finally, in section eight, I will argue that (II) is mistaken, or at least inadequately argued for. The harm principle could either refer to salient causes (as Sinnott-Armstrong 2005 presume), or to causes in a non-discriminatory, broad sense. If the latter is correct, the saliency of a cause is irrelevant for the matter at hand. Because of this possibility, Sinnott-Armstrong cannot conclude that there is no moral obligation to refrain from joyguzzling since joyguzzling is not a salient cause of global warming. It could however turn out that the former is correct. Still, there is some ground for doubting the criteria for saliency that Sinnott-Armstrong (2005) uses, and therefore he cannot use these criteria for showing that a leisure drive is not one of many salient causes of global warming and its related harms. Before we proceed, I should say that apart from simple, NESS and Lewis’ elaborated analysis, there are other candidates for being the most plausible account of causation, such as those proposed by Hitchcock (2001), Schaffer (2003, 2005) and Woodward (2003). Due to limitations of space, I will refrain from discussing whether these competing accounts of causation would entail that a single leisure drive causes global warming (etc.). I will also refrain from evaluating whether Lewis’ elaborated analysis of causation is superior to its rivals (apart from simple and NESS). It seems to me, however, that Lewis’ account fruitfully can be applied to the question of whether a single leisure drive causes global warming. At least, it is far better suited for analysing this question than simple. Shooting and poisoning: D shoots and kills P just as P was about to drink a cup of tea that was poisoned by C.
Bottle shattering: Billy and Suzy throw rocks at a bottle. Suzy throws first, or maybe she throws harder. Her rock arrives first. The bottle shatters. When Billy's rock gets to where the bottle used to be, there is nothing there but flying shards of glass. Without Suzy's throw, the impact of Billy's rock on the intact bottle would have been one of the final steps in the causal chain from Billy's throw to the shattering of the bottle. But, thanks to Suzy's preempting throw, that impact never happens. If we assume simple, D did not cause P’s death since P’s death would have occurred whether or not D had shot P, and Suzy did not shatter the bottle since the bottle would have shattered whether or not Suzy had thrown a rock at the bottle, and these are of course problematic results. Considering how simple could accommodate cases of pre-emption despite first appearances, Lewis (1986) suggests that we could consider events in a more fine-grained manner. In a case like Shooting and poisoning we could say that P’s dying by being shot is not the same event as P’s dying by being poisoned. Here, this strategy seems to give the desired result; D causes the event P’s dying be being shot since that event would not have occurred if D had not taken the shot. How much delay or change do we think it takes to replace an event by an altogether different event, and not just by a different version of the same event? An urgent question, if we want to analyze causation in terms of the dependence of whether one event occurs on whether another event occurs. Yet once we attend to the question, we surely see that it has no determinate answer. We have not made up our minds; and if we do presuppose sometimes one answer and sometimes another, we are entirely within our linguistic rights. Since simple gives problematic results in some important cases of pre-emption and overdetermination, we should not use this principle to evaluate alleged causes of global warming and climate change. Arguably, these events are of the problematic kind. if individual actions such as Sunday drives are not causes of climate change, then what does cause climate change? This question could be repeated for global warming and for climate change related harm. To appreciate the problem this question hints at, one must realize that the claim that a single leisure drive does not cause climate change, if correct, applies to any emission of greenhouse gases in roughly the same quantity as a single leisure drive. In the causal evaluation, it does not matter that the car ride is just for fun, or that it occurs on a Sunday, and it does not matter that the emission comes from a car. Considering Hiller’s question, one might wonder if there are any individual emissions of greenhouse gases that would be large enough to be necessary and sufficient for climate change to occur. Maybe the emissions of some huge coal-fired power plant could be said to cause (some part of) a certain climate impact. Even so, such huge emissions could only account for a portion of the totality of climate change. In addition, if events are measured in short enough intervals; even the biggest industry would emit only small quantities of greenhouse gases per event, and it is unlikely that such small quantities make a difference for the occurrence of any climate impact. So, if we accept Sinnott-Armstrong’s arguments, a great deal of climate change and of global warming seems to be uncaused. Now, Sinnott-Armstrong does not think that global warming is uncaused and he is not a climate sceptic. For instance, he asserts “a significant amount of global warming is due to human activities. The main culprit is fossil fuels” (Sinnott-Armstrong 2005: 294). His position is rather that the sum of all human greenhouse gas emissions causes global warming, while no individual emission does. Hiller uses this claim to argue that” if we assume that the sum total of AGCC [anthropogenic global climate change] is causing harm [as Sinnott-Armstrong does], then we can show that any individual act that contributes to AGCC also causes an expected harm” (Hiller 2011: 355). The idea is that if all acts taken together cause huge harm, on average each act causes some harm. The reason why Hiller appeals to expected harm rather than just harm is that it is possible that some slight increases in the amount of greenhouse gases in the atmosphere are beneficial, some slight increases might make no difference at all, and some slight increases might make a huge difference for the worse. However, he argues, since no one knows exactly which effect his or her particular drive will have, we should instead consider the expected utility of such a drive to be what is morally relevant. Hiller then goes on to calculate the expected utility of a single drive, proceeding from Nolt’s (2011) estimation that an American’s lifetime greenhouse gases emitting activities on average cause serious harm to one or two people. Using simple arithmetic, we can calculate, Hiller argues, that “going on a Sunday drive is the moral equivalent of ruining someone’s afternoon” (2011: 357, italics as in the original). However, Hiller is wrong in thinking that if many acts together cause great harm, each act causes some harm (on average). If he stays with assuming something like simple, he cannot argue this way. If we assume simple, a single drive has no chance of causing global warming (etc.). Global warming would occur whether or not I went for a leisure drive. Further, it does not seem to help us at this point to adopt a fine-graining strategy. It is doubtful that my leisure drive would make any storm, flood or drought turn into a different event. Therefore, the expected global warming related utility of such a drive is zero (or close to it, considering the possibility that my drive might have some butterfly effect). While Hiller succeeds in explaining why it is unreasonable to think that a single drive makes no tiny causal contribution to global warming, he fails to show that a leisure drive has a negative expected utility. Shelly Kagan (2011) advances another type of argument for the expected utility approach. He argues that all collective harm cases7 are triggering cases, that is cases where “it is indeed true for most acts that it makes no difference whether or not I do it, but for some act—the triggering act—it makes all the difference in the world” (Kagan 2011: 119). Therefore, he argues, even though my act most likely will cause no harm at all, there is a risk that it might trigger great harm. This is why I should refrain from, for instance, joyguzzling. However, it seems that just as adding one single grain of sand to a collection of such grains has no probability of turning this collection into a heap, a single leisure drive has no probability of triggering global warming, climate change and their related harms.8 This is also pointed out by Kingston and Sinnott-Armstrong (2018). The argument from aggregation, namely that our individual actions are potentially harmful to others not by themselves, but because they are part of a set of similar actions which together cause harm, delivers very strong reasons in favour of individual emission reductions. The reply that Kingston and Sinnott-Armstrong imagine that Brutus could have given Caesar illustrates the idea that even though the group of senators causes Caesar’s death, no individual senator does. (Again, it is clear that their argument presupposes something like simple). In order for the bad outcome that the group causes to reflect badly on a participating individual, there must be something that connects the individual to the group outcome. Kingston & Sinnott-Armstrong agree that each senator is both causally and morally responsible for Caesar’s death, but they suggest that this is so only because the senators conspired to kill him (they performed a collective action) and because each senator intended to kill Caesar.11 These factors, they argue “can explain why each Senator’s act is seen as causing harm and as morally wrong” (Kingston and Sinnott-Armstrong 2018: 172). There is something that connects the harmful group act to each participating individual. However, they continue, none of these conditions are satisfied in joyguzzling: usually, someone who goes for a leisure drive does neither collaborate with others to bring about global warming and its related harms, nor intend global warming (etc.) to occur. In order for Schwenkenbecher’s argument to hold, she must show that there is something that connects the group outcome in cases like joyguzzling to each individual driver. Kingston & Sinnott-Armstrong’s idea that factors such as intending and conspiring to do harm might render a non-cause a cause is problematic. First, if the senators conspired to kill Caesar, it is not necessarily the case that no senator caused Caesar’s death. In fact, simple can straightforwardly explain why most senators are causally responsible for Caesar’s death: one senator might have hinted at the idea of killing Caesar, another might have stated it more boldly, a third might have suggested a general plan, a fourth might have proposed that they should stab him instead of poisoning him, a fifth might have suggested that they should do it on the Ides of March instead of during summer, etc. If this is how things transpired, most of the senators made a difference for the occurrence of Caesar’s death. Second, as I will explain in more detail in section eight, if we assume that Caesar’s death was truly overdetermined – that is, if we assume that no senator made a difference for the occurrence of Caesar’s death, neither during planning nor during the execution of the plan – it is problematic to assume that the senators’ intentions to cause harm turn their otherwise ineffectual actions into causes of Caesar’s death. Further, Kingston and Sinnott-Armstrong (as well as Schwenkenbecher, Kutz, Hiller etc.) are wrong in thinking that the group of drivers causes global warming (assuming simple). Simple states that all of us who drive cars running on fossil fuel cause global warming if and only if global warming would not occur had not all of us driven cars running on fossil fuel. However, had one driver refrained from going for a leisure drive, global warming would still occur. The same goes if ten or a hundred drivers would have refrained from going for any single drive. If you think that simple entails that all drives cause global warming, you probably think that had none of these drives occurred, or had enough of them not occurred, global warming had not occurred. However, it is not clear that this is the relevant contrast. Until we have established the relevant contrast, we must conclude that it is indeterminate whether the group of all drives causes global warming (assuming simple). The same argument could be repeated for climate change and its resulting harms. In fact, a similar argument could be made for showing that the group of senators did not cause Caesar’s death.12 Had one senator at the last minute been prevented from participating in the murder, a group consisting of 22 senators had still stabbed Caesar, whereby his death had occurred anyway. Therefore, had not the group consisting of 23 senators done what they did, Caesar would have died anyway. Again, we should not conclude from this that the set of drives does not cause global warming (or that the senators did not cause Caesar’s death), but rather that there is something problematic about simple. What we need is an analysis of causation that helps us to establish which acts that belong to the relevant set. NESS: A condition C was a cause of a consequence E if and only if it was necessary for the sufficiency of a set of existing antecedent conditions that was sufficient for the occurrence of E.
This reply would have been accurate, and some views of causation will see Brutus’ stabbing as not a cause of Caesar’s death. These include accounts in which acts must be themselves necessary or necessary parts of sufficient sets in order to be causal. It seems that Kingston & Sinnott-Armstrong have misunderstood NESS. Of course Brutus’ stabbing was a necessary part of a set of existing antecedent conditions sufficient for Caesars’ death. One major reason behind thinking that NESS gives a better account of causation than simple is exactly that NESS often give the right answer in cases of overdetermination. To take a straightforward example: If two shooters simultaneously shot me, and if both shots were sufficient to kill me, then simple would entail that neither shooter caused my death (since neither shot was necessary for bringing about my death),13 but NESS would entail that both shooters caused my death (each shot is necessary for the sufficiency of the set of actually obtaining antecedent conditions containing that shot but not the other). Similarly, in stabbing Caesar, NESS entails that all senators caused Caesar’s death. One might think that our ignorance of how many stabs that were minimally sufficient to kill Caesar prevents us from determining whether Brutus’s stab was necessary for the sufficiency of a particular set. However, this ignorance is irrelevant. For all possible answers to the question ‘How many stabs were sufficient to kill Caesar?’, Brutus’s stab is necessary for the sufficiency of some sets of existing antecedent conditions. If say fifteen stabs (but not fourteen) were sufficient to cause Caesar’s death, then Brutus’ stab was necessary for the sufficiency of quite a few actually obtaining sets consisting of fifteen stabs, and it suffices that his stab was necessary for the sufficiency of one such set for it to be true that Brutus caused Caesar’s death. If it instead turns out that twenty (but not nineteen) stabs were sufficient to cause Caesar’s death, Brutus’s stab would be necessary for the sufficiency to cause Caesar’s death of quite a few of the sets that consist of twenty stabs. Still, even though Kingston & Sinnott-Armstrong are mistaken about what NESS entails in stabbing Caesar, their conclusion that NESS does not entail that a single drive causes global warming is correct. One single drive is not necessary for the sufficiency of any set of antecedent conditions for global warming. Our concept of global warming is too coarse-grained for this to be the case. To say that a single drive satisfy the NESS-condition for causing global warming is like saying that adding a single grain of sand to a collection of grains of sand optimally arranged was necessary for the sufficiency of turning this collection into a heap. It would be analogous to saying that without this addition, the collection would not be sufficiently large to amount to a heap.14 For NESS to entail that adding one grain of sand to a collection of grains of sand optimally arranged might cause this collection to become a heap, there must be some threshold such that if the collection contains n grains of sand, this collection is not a heap, but when the collection contains n + 1 grains of sand, it is a heap. However, there is no such threshold. Likewise, in joyguzzling, there is no threshold such that n drives are not sufficient to cause global warming, but n + 1 drives are. This contrasts to stabbing Caesar, where one stab (we do not know which) does make a difference for Caesar’s death. Somewhere, there is a threshold in this case. Elaborated: C influences E if and only if how, when or whether C occurs makes a difference for how, when or whether E occurs. The reason why we assume elaborated tentatively is that this analysis requires an adjustment in order to fully capture Lewis’s account. If the influence C exerts on E is minuscule, Lewis argues, we might be justified in neglecting this influence and conclude that C does not influence E enough to count as a cause. I will soon get back to this issue. C causes E if and only if there is a causal chain leading from C to E, where a causal chain is a sequence of causal influences. This means that if C influences D, and D influences E, then C causes E, and this is true even if C does not influence E. In the most trivial case where C influences E directly, C does of course cause E. The transitivity of causation has implications for the question of whether a single drive causes climate change related harm. I will return to this issue in section seven. If we abandon simple in favour of elaborated, we must conclude that a single drive influences global warming, and therefore that it causes global warming. The emissions produced by such a drive influence how and possibly when global warming occurs; global warming will be the same event, but it will come in a slightly different version – it will occur in a slightly different manner or at a slightly different time – given the addition of these extra CO2 molecules. By the law of universal gravitation, a distant planet makes some minute difference to the trajectory of Suzy's rock, thereby making a tiny difference to the shattering of the bottle. So by adopting the fragility strategy, in whichever form, we open the gate to a flood of spurious causes. This problem becomes especially acute when we realise that also the gravitational force of Billy’s rock might influence the bottle shattering in some minute way, whereby we get the undesired result that Billy’s throw in fact caused the bottle shattering. Well, these differences made by spurious causes are negligible; so, surely, we are entitled to neglect them. Just as it is right to say that a box contains nothing when, strictly speaking, it contains a little dust, so likewise we are within our linguistic rights to say that Billy's throw made no difference to the shattering when, strictly speaking, its gravitational effects made an imperceptibly minute difference. Elaborated*: C influences E if and only if how, when or whether C occurs makes enough of a difference for how, when or whether E occurs. If we assume elaborated*, it seems that a single leisure drive might not cause global warming after all. The differences in global warming produced by one single drive are not significant enough to turn one version of global warming into another. There are substantially larger emissions than those produced by a single drive, for instance those made by large coal-fired powerplants (given that we do not individuate these emissions events too much). Why would not such an emission count as a cause of global warming, while the emissions from a single drive would not? Similarly, if we consider my decision to go for a single drive, the effects such a decision has for global warming (assuming that my decision in fact makes me go for such a drive) makes much less of a difference for global warming than a governmental decision to allow for offshore oil drilling (given that such a decision results in actual drilling and, in the longer run, lower fuel prices and more emissions of greenhouse gases from burning fossil fuels). It seems that considerations such as these might explain a common position with respect to global warming: what I do as an individual does not cause global warming,15 but that governmental decisions and the decisions of most large companies do. As we have seen, this is a view that Kingston and Sinnott-Armstrong subscribe to (albeit for a mistaken reason, see section 3). [I]f for some strange reason we did attend to these negligible differences, would we not then put ourselves in an unusual context where it was right, not wrong, to count all the things that make negligible differences as joint causes of the effect? The fundamental question then becomes whether we are in a context where we have reasons to consider also minuscule differences in how and when global warming occurs. One problem for settling the issue whether a single drive causes global warming is that the only guidance Lewis gives to decide this is that an event does not count as a cause of a certain outcome if it influences this outcome to a much lesser extent than some other event. However, when it comes to global warming, there is no natural place to draw the line between the emissions that are too small to count as causes, and those that are large enough to do so. In joyguzzling, there are not only two potential causes as in bottle shattering, one which greatly influences the outcome and one which only influence the outcome to a minuscule extent, but a whole range of potential causes of different sizes. Single drives could be longer or shorter, there are companies emitting less and companies emitting more. The decisions of smaller governments have less of an impact on global warming than the decisions of larger ones, etc. We could choose to draw the line at one particular level, saying that all smaller emissions do not count as causes and that all the larger ones do, but wherever we draw the line, there will be some arbitrariness about the choice. This means that it is indeterminate whether a single drive causes global warming, and this indeterminacy is due to conceptual inexactness. Our concept of global warming does not univocally set the level of specification of how and when this event occurs, and given the circumstances there is no natural way to specify this level. Elaborated* paired together with the guidance Lewis provides for deciding when a potential cause makes enough of a difference do not help us settling the matter. This might not be the end of the matter. Apart from the considerations Lewis suggests to be relevant for causal evaluations, other considerations have bearing on the matter.16 There are at least two further reasons in favour of thinking that a single drive causes global warming. First, if we do not consider a single drive to cause global warming, we get an explanatory deficit. Hiller’s question re-emerges. If emissions on the level of a single drive do not cause global warming, then what does? Are we dealing with an uncaused effect? If we only consider emissions on the scale of those produced by coal-fired coal powerplants to cause global warming, a substantial amount of global warming would be left unexplained. Flood: Global warming is more like a river that is going to flood downstream because of torrential rains. I pour a quart into the river upstream (maybe just because I do not want to carry it.) My act of pouring the quart into the river is not a cause of the flood. Analogously, my act of driving for fun is not a cause of global warming. Sinnott-Armstrong is however wrong in assuming that these cases are analogous. To begin with, in flood there are only two potential causes: the torrential rain and my pouring a quart of water into the river. Therefore, we can safely conclude that my act of pouring the quart of water into the flood did not cause the flood if we assume elaborated* and follow Lewis’ guidance. The torrential rains influence the downstream flood to a much higher degree than my pouring quart of water into the flood. Had the torrential rains occurred at a different time, in a different manner or not at all, the flood would have changed correspondingly. However, had I refrained from pouring a quart of water into the river, or poured it at a different time or in a different manner, the flood would have occurred in more or less the same manner and at the same time. Therefore, we are entitled to neglect my act of pouring water; this act is analogous to Billy’s throw. However, in in joyguzzling, there are loads of potential causes with varying degree of influence. Secondly, in flood, the explanatory deficit if we disregard the influence of my pouring water into the river is negligible. However, in joyguzzling, if we disregard each individual drive as not being a cause of global warming, it seems that we cannot fully explain what caused this phenomenon. Thirdly, if we seek to prevent future floods from occurring, it suffices to concentrate on how to prevent future torrential rains to cause floods. Since the small amount of water I contributed to the flood is negligible, we are allowed to disregard this contribution. Things would have been different if the flood was caused by billions of people each pouring a quart of water into the river. In such a case, we would have a reason to consider also minor contributions. Likewise, if we seek to prevent as many climate change related harms as possible, it might not suffice to concentrate on events that influence these harms to a great extent (such as emissions from huge coal-fired powerplants and some political decisions). Instead, we might also have reasons to consider more minor emissions, such as those produced by a single drive. I will leave it unsaid whether these considerations give us decisive reason to conclude that a single drive in fact do cause global warming. Instead, I will rest with the conclusion that if we assume elaborated* and follow the guidance Lewis gives for deciding when a potential cause makes enough of a difference to count as a cause, it is indeterminate whether a single drive causes global warming. Some might balk at this conclusion. Towards the end of the paper, I will offer some considerations that hopefully make it more palatable. One of Kingston and Sinnott-Armstrong’s arguments for thinking that my single drive does not cause climate change related harm is that the only difference (if any) this drive makes is that harm would occur a fraction of a second earlier than it otherwise would (an argument I earlier called Ib). A similar argument has previously been advanced by Maltais (2013). Assuming elaborated, and granting that my drive would affect the timing of harm’s occurrence, we must conclude that my drive actually influences climate change related harm. This way, assuming elaborated can quite straightforwardly refute one of their arguments in favour of thinking that a leisure drive definitely does not cause climate change related harm. Yet, considering that the influence my drive exerts on climate change related harm might be negligible, we should say that my drive definitely makes some difference in the timing of harm’s occurrence, but that it is indeterminate whether this minuscule difference is negligible or not, and therefore it is indeterminate whether my drive causes climate change related harm. In other words, if we assume elaborated*, it is indeterminate whether my drive causes global warming. Still, Kingston and Sinnott-Armstrong (2018) are quite reluctant in granting that a single drive affects the timing of climate change related harm. So, how about their argument that global warming and climate change are emerging phenomena (what I earlier called argument Ia)? This argument needs some elucidation. They advance this argument partly in order to answer a worry that Hiller (2011) raises. Recall that Hiller poses the question: if a single leisure drive does not cause climate change, what does? Recall also that Sinnott-Armstrong (2005) does not consider climate change to be an uncaused phenomenon; he considers a significant amount of global warming to be due to human activities. However, Hiller argues, it seems a bit odd to claim that a single car ride does not cause global warming, but that global warming is due to human activities. If individual drives do not make any difference in AGCC, but everyone’s driving does, then everyone's driving would have to be some odd emergent entity that is not reducible to individual acts of driving. This is where Kingston & Sinnott-Armstrong’s argument that global warming and climate change are emergent phenomena comes in. If global warming and climate change would be emergent phenomena, everyone’s driving could be a cause of these phenomena while individual drives are not. The existence of emergent properties is controversial in metaphysics, as is the claim that emergent properties can cause any effects. But at least our opponents have not shown that global warming is not emergent. As a result, they have not shown joyguzzling is causal. (Kingston and Sinnott-Armstrong 2018: 176). To advance the thesis that global warming and climate change are emergent phenomena, they propose two arguments. First, they use an analogy concerning emergent properties of oil molecules. Following Wimsatt (2007), they argue that emergent properties can be contrasted to aggregative properties, such as mass. One molecule of oil has mass, but lacks properties like sliminess and colour. If the property of greenhouses gases needed for them to contribute to global warming is an emergent one, they would have a case. However, the relevant property of greenhouse gases is not emergent in the way the sliminess of oil is. Even though an individual molecule of CO2 does not on its own cause additional floods, draughts etc. (except possibly for butterfly effect cases), it can absorb a photon and re-emit it; therefore, it has – on its own – the ability required for hindering heat radiation from escaping earth. This property, which is an essential property of greenhouse gases, is aggregative. When the molecules are arranged properly in the atmosphere, the group causes climate change (as well as individual storms), but the same molecules would not cause climate change (or individual storms) if they were re-arranged into a thin sheet only one molecule thick far from the earth’s surface. In this case, any photon absorbed and re-emitted by a particular molecule would most likely be released at one of the many angles that would see it miss the earth, rather than back towards it as typically happens when the molecules are arranged thickly nearer the earth. It is true that the arrangement of the molecules matters for the degree of global warming, but this does not make the relevant property of greenhouses gases emergent. Individual oil molecules lack the property of being slimy because this property is something that arises in the interaction between the oil molecules. Unlike an oil molecule which lack the property of being slimy, each molecule of CO2 has the ability to absorb and re-emit photons. Further, you might think that even if individual CO2-molecules have the ability to absorb and re-emit photons, they lack the ability to re-emit them towards earth.18 However, given the vast amount of time the molecule will be in the atmosphere, it is overwhelmingly likely that it will re-emit quite a few photons back towards earth, photons that otherwise would have escaped earth. The only difference in the case where the molecules are spread out in a thin layer far from earth is that the re-emitted photon has less of a chance to be re-emitted towards earth, hence the lower degree of global warming. But still, given the time most CO2-molecules stay in the atmosphere, and given how many such molecules a single drive emits, there is no real possibility that no molecules from a single drive would re-emit photons towards earth. In some places, Kingston and Sinnott-Armstrong say that individual molecules of oil lack the property of being slimy because we cannot feel them. For instance, they write: “An individual molecule is not slimy in the least. We cannot feel any individual molecule at all, so it cannot feel like slime.” (2018: 175). However, whether we can perceive a property cannot be the relevant consideration here. What is relevant is whether an individual molecule has the property relevant for being able to cause the outcome in question. Finally, and perhaps most importantly, given elaborated it suffices that the greenhouse gases produced by my leisure drive re-emit some photons back to earth in order for global warming to occur in a slightly different manner. Global warming would come in another version if I joyguzzle. The photons re-emitted towards earth would be taken up by some matter on earth, and thereby make the molecules of this matter move slightly faster, something which constitutes raising the temperature of this matter. This way, my drive influences the event of global warming. Therefore, going for a leisure drive causes global warming. But, once again, if we instead assume elaborated*, we might or might not have reasons to think that the influence my leisure drive exerts on global warming is sufficient enough for my drive to count as a cause, and therefore we must conclude that it is indeterminate whether my drive causes global warming. You could understand Kingston & Sinnott-Armstrong’s argument from emergence in a different way. In some places, it seems that they are not taking the analogy between the sliminess of oil and the greenhouse gases’ ability to cause global warming literally, but rather to illustrate that just as properties can be emergent, so can events. For instance, they write: “Just as individual molecules of oil do not cause parts of sensations of sliminess (or yellowish color), so individual molecules of greenhouse gas do not cause parts of dangerous climate impacts” (Kingston and Sinnott-Armstrong 2018: 175). On this view, global warming as well as individual climate impacts are emerging events, and they are emerging relative to individual emissions of greenhouse gases since no particular emission causes these events, while the set of emissions does. If this is the idea, this argument basically amounts to reiterate that global warming and climate impacts are collective harm problems, albeit doing so in a more illustrative way. However, as I already have argued, the idea that a single drive causes neither global warming nor climate change relies on the problematic assumption that something like simple is true. Moreover, as I also have argued, if we assume simple, it is far from sure that we can conclude that the set of all actual emissions do cause global warming. I should add that there might be properties of greenhouse gases that are essential for their ability to cause global warming that are emergent, properties that I have failed to discuss here. If this would turn out to be the case, Kingston and Sinnott-Armstrong would be correct after all. However, as I think my argument shows, they have yet to show that this is the case. Burst seawall: A seawall bursts due sea level rising. If I had not gone for a leisure drive, this event would have happened in a slightly different manner; it might have happened a fraction of a second earlier, the initial crack in the sea wall might have been at a slightly different place due to a minuscule difference in the currents of the water pushing against the sea wall, or the water rushing through the burst seawall might have done so in an ever so slightly different manner. If this were the case, my leisure drive would be a cause of the burst seawall and of the resulting flood if we assume elaborated. Burst seawall continued: Say that this flood harms you; you get swept away in the flood, bumping into several objects and get severely injured. Imagine further that the harm you experience would be exactly the same whether or not I had refrained from going for a leisure drive; you would have bumped into exactly the same objects, contracting the same injuries etc. We could further assume that there is no difference in imperceptible harm as well; your neurons are firing at exactly the same rate and manner in both cases. There is nothing bad about global warming or climate change in itself if no people (or animals) are harmed. But there is no individual person or animal who will be worse off if I drive than if I do not drive my gas-guzzler just for fun. Global warming and climate change occur on such a massive scale that my individual driving makes no difference to the welfare of anyone. Neuroscientist: The neuroscientist knows just how she wants Jones to behave. She hopes that Jones, left to himself, will behave just as she wants. By reading his brain, she can predict what he will do if left to himself. She predicts that he will do just what she desires, so she does nothing else. But if instead she had read that he would stray from the desired path, she would have taken control and manipulated his brain directly so as to produce the desired behavior. Lewis assumes that the right conclusion in neuroscientist must be that Jones’s initial brain state (C) caused his subsequent behaviour (E), but this is not the result we get if we apply elaborated*; his behaviour will be exactly the same even if there is a change in how, when or whether his initial brain state occurs. The remedy to this problem is to look at the transitive ancestral of counterfactual dependence: causation; and to distinguish an intermediate event (D) consisting of the combination of neuroscientist’s decision not to intervene and Jones’ brain state at that time. Here, it is clear that Jones’ initial brain state (C) influenced (D). A difference in Jones’ initial brain state (C) would have resulted in a difference in the neuroscientist’s decision (which partly constitutes D). Further, (D) caused (E): had for instance the neuroscientist decided to change Jones’ brain state in some way, (E) would have turned out different. This way, we have a chain of influences going from (C) to (E), explaining why (C) caused (E) in this case. If causation is the transitive closure of causal influence, this means that if my leisure drive influences the breaking of the sea wall, and the breaking of the sea wall in turn influences your well-being in a negative way, I have caused you harm. Likewise if we take this in several steps; if I influence global warming, which in turn influences the sea level rising, which in turn influences the breaking of the sea wall, which in turn harms you, I have caused you harm. Still, there is the question of whether my leisure drive really makes enough of a difference for the breaking of the sea wall in order to count as a cause. As before, if we assume elaborated, it definitely does, and so we must conclude that my leisure drive causes you harm in burst seawall; but if we instead assume elaborated*, it is indeterminate whether my leisure drive makes enough of a difference for the breaking of the sea wall, and therefore we must instead conclude that it is indeterminate whether my leisure drive causes you harm. You could of course deny that counterfactual causation always is transitive; you might agree with writers such as Douglas Ehring (1987) and Ned Hall (2000, 2004) that there are counterexamples to the transitivity of counterfactual causation. (For a defence of the transitivity of causation, see for instance Paul 2000; Maslen 2004, and of course Lewis 2000). Still, even if it would turn out that causation is not always transitive, causal transitivity might hold in burst seawall. As a final point, if you still do not think that causation is transitive in cases like burst seawall, and therefore conclude that my leisure drive does not cause you harm in this case, you might still conclude that my leisure drive might cause other people harm. After all, quite a few instances of climate change related harm might be directly influenced by my leisure drive. Think for instance of cases where my leisure drive causes minuscule differences in how and when a sea wall breaks, and when these minuscule differences in turn makes a minuscule difference for how and when some people are harmed. In these cases, because I go for a leisure drive, some people are harmed in a slightly different way or at a slightly different time. If this is the case, we do not have to assume that causation is transitive in order to conclude that I cause harm when I go for a leisure drive (if we assume elaborated), or that it is indeterminate whether I cause harm (if we assume elaborated*). We can now turn to Sinnott-Armstrong’s second argument for thinking that a leisure drive does not cause climate change: the argument that joyguzzling does not cause climate change since there are no special reasons to pick out that act out of all the other background conditions and identify it as a cause (the argument I earlier called II). As a contrast to the joyguzzling case, he considers a case where five persons are pushing a car with a person locked inside off a cliff. In order for them to succeed in this endeavour, it is sufficient that three persons help pushing. However, I join them in pushing. Here, he assumes that “my act of pushing is a cause (or part of the cause) of the harm to the passenger” (Sinnott-Armstrong 2005: 297), and this is so even though my act is neither sufficient nor necessary for the outcome. “Why”, he continues, “Because I intend to cause harm to the passenger, and because my act is unusual.”19 These factors, he continues, are lacking in the joyguzzling case; people who go for a leisure drive does not do so intending to bring about climate change related harm, and such acts are not unusual. Note that we must go back to assuming something like simple in order to fully appreciate Sinnott-Armstrong’s argument. If we would assume elaborated or NESS instead, it seems obvious that my pushing the car causes harm to the person locked inside; the car might for instance go over the cliff at an earlier time given that I help pushing. Match Lighting: For a match to light up, we need to strike it so as to create friction. There also has to be oxygen. We do not call the oxygen the cause of the fire, since oxygen is usually present. Instead, we say that the friction causes the match to light, since it is unusual for that friction to occur. It happens only once in the life of each match. However, it seems a bit odd to use the match lighting example to illustrate how the rarity of an event might turn something that otherwise is a non-cause into a cause. After all, match lighting is not a case where the resulting event is overdetermined. If friction had not occurred, the match had not been lighted. Therefore, this example cannot be used to show that the rarity of a condition serves as a reason to identify this condition as a cause in a case where the effect is overdetermined. There is another view in the vicinity of the one that Sinnott-Armstrong (2005) suggests. Hart and Honoré (1985) suggest that a cause stand out as salient if it is abnormal (i.e. rare) or if it consists in a voluntary human action (for instance an act performed with the intention to harm). Still, on their account, a cause can only stand out as salient if it is a cause to begin with. That a cause is abnormal or intentional does not turn a non-cause into a cause, as Sinnott-Armstrong assumes it does.20 Instead, to deal with cases of overdetermination, Hart & Honoré claims that a in order for an event to be a cause of an outcome, it must either be necessary or sufficient for the occurrence of this outcome. They briefly elaborate what it means for a cause to be sufficient for an outcome to occur, and they end up holding an analysis that is very close to NESS. Therefore, on their account, the person that joins others in pushing a car over a cliff would be causing harm to the passenger trapped inside on their account, not since he intentionally does this, but since his pushing is a necessary part of a sufficient condition for harming the passengers. In contrast to, say, gravity, his pushing is also a salient cause of the harm done to the passenger trapped inside the car since he is pushing with the intent to harm the passenger (this goes for each of those who helps pushing the car). We sometimes single out one among all the causes of some event and call it "the" cause, as if there were no others. […] We may select the abnormal or extraordinary causes, or those under human control, or those we deem good or bad, or just those we want to talk about. In another sense – the broad sense – each condition is a cause, salient or not, that bring about the effect. On this view, both friction and the presence of oxygen count as causes of the match lighting. There are also other conditions that would count as causes, such as the fact that the match is made of flammable matter, and that one end of the match is coated with a material that can be ignited by frictional heat. This is the sense of causation that Lewis aims at analysing, both in his (1973) “Causation” and in his (2000) “Causation as Influence”, and this is also the sense of causation the NESS-condition gives an analysis of. This raises the question of whether the harm principle refers to salient causes or to causes in the broad sense. If it refers to causation in the broad sense, it might entail that we have a moral obligation not to go for a leisure drive even if Sinnott-Armstrong (2005) would be correct in claiming that we have no reason to identify this drive as a salient cause of global warming. It would for instance entail this if we assume that elaborated correctly describes causation in the relevant sense. It would also entail this if we assume that elaborated* correctly describes causation in the relevant sense and if we have sufficient reason to consider global warming to be a very fragile event. Whether the cause stands out as salient would be of no importance for what the harm principle entails. Things get a bit more complicated if we understand the harm principle as instead referring to salient causation. If we want to evaluate whether this principle entails that I have a moral obligation to refrain from going for a leisure drive because it causes climate change related harm, we need some criteria for deciding whether such a drive counts a salient cause of this harm. One problem is that the criteria that and Hart & Honoré suggest and Sinnott-Armstrong makes use of (i.e. intentionality and abnormality) are not entirely reliable. As Lipton argues, “[i]f I tell my young son that he dropped his food on the floor because he was not paying attention to the task at hand, I do not imply that this is an unusual state of affairs” (Lipton 1992: 134). We could add that nor would he imply that his son dropped the food on the floor intentionally, but still the son’s behaviour is the salient cause for why the food end up on the floor. For another example, reckless drivers are common and they do not intend harm, still such drivers might be the salient causes of harm. Moreover, if we accept these criteria, we must also accept that there might be some agents going for a leisure drive that actually cause climate change; namely all those who intend climate change to occur. Admittedly, there are probably not many such agents, but there might be some malicious agents that are tired of humanity and that want them to suffer, or some agents living in the arctic areas of the world aiming for a warmer climate where they live. It seems however that if these agents are causing climate change, they do so regardless of what they intend to do. Their intentions might have implications for their moral responsibility (i.e. whether they are blameworthy or praiseworthy), but not for their causal ditto. This should make us hesitant to use the suggested criteria. It might turn out that there are no fixed criteria governing whether a cause stands out as salient. Instead, this issue might be fundamentally perspective dependent. For instance, when a house is burning, the fire fighters might see the presence of oxygen, heat and flammable material as the salient causes of the fire, and thereby aim at extinguishing the fire by reducing the access to one or more of these elements. Conversely, the police at the scene might see the arsonist’s lighting of the fire as the salient cause. If saliency is fundamentally perspective dependent in this way, it would seem odd to hold that the harm principle refers to salient causation. Why would the question of whether I have a moral obligation not to harm someone be perspective dependent? What would this even mean? That I only have a moral obligation not to harm someone if there will be no one from whose perspective my act will stand out as the salient cause of harm? As one final consideration, it might be the case that we should understand the intentionality criterion as referring to the content of the agent’s mental state when acting rather than to the reason because of which the agent is acting. In that case, this criterion would entail that there is a moral obligation not to knowingly cause harm even if this harm is merely foreseen and therefore also that I have a moral obligation not to go for a leisure drive (given that I am aware that doing this contributes to global warming and its related harms). In order to settle this question, we first have to settle the question of whether the doctrine of double effect is accurate, and that is too big of an issue for this paper. Kingston and Sinnott-Armstrong’s conclusion that a single leisure drive does not cause global warming and climate change relies on the assumption that something like a simple counterfactual analysis of causation is correct. However, this analysis is known to give problematic results in cases of overdetermination and pre-emption. Since global warming, climate change and their related harms are typical examples of these kinds, we should hesitate to assume this analysis of causation in this context. If we instead assume a more elaborated analysis of causation, like the one that Lewis (2000) suggests, it turns out that it is indeterminate whether a single leisure drive causes global warming. This indeterminacy is partly due to that there is no natural way to distinguish the emissions of greenhouse gases that have large enough influence on global warming to count as causes from those that have not. Since there is no natural way to make this distinction, cases like joyguzzling are in fact importantly different from cases like shooting and poisoning and bottle shattering. If we go beyond the guidelines Lewis suggests to decide whether a potential cause has large enough of an influence, we might find reasons to consider also minuscule differences in how and when the outcome occurs to matter. If we are in a context where we wish to explain global warming, or where we wish to control it, we have reasons to consider also small emissions of greenhouse gases, such as a those produced by a single drive, to exert enough of an influence to count as causes. In such a context, we might have reasons to consider global warming to be a very fragile event. Moreover, if a single drive does not directly influence climate change induced harm (if it does not influence how, when or whether the firing of neurons of any victim of climate impacts occurs), a single drive might still be said to cause harm. Since a single drive influences global warming, and global warming influences climate change, and climate change in turn influences climate change induced harm, a single drive causes this harm if causation is transitive in this case. Finally, Sinnott-Armstrong’s (& Kingston’s) argument that a single drive cannot cause global warming since there are no special reasons to pick out that act out of all the other background conditions and identify it as a salient cause of global warming is mistaken, or at least inadequately argued for. It is mistaken if the harm principle refers to causes in the broad sense since. In that case, the saliency of a cause would not matter for whether I have moral obligation not to cause harm. If the harm principle instead refers to salient causes, we need some reliable criteria to distinguish salient causes from mere background conditions. Without such criteria, the moral obligations the harm principle entails becomes implausibly dependent on people’s perspective on why harm occurred. However, the criteria that Sinnott-Armstrong uses are susceptible to counterexamples. Some might be dissatisfied by the conclusion that it is indeterminate whether a single drive cause global warming if we assume elaborate*, so I want end this paper by offering some considerations that hopefully might render this conclusion more acceptable. First, there might be semantic issues lurking here. You might think that it is absurd to say that a single drive causes global warming since saying so implies that such a drive is the only cause of global warming. This linguistic intuition might spill over, and make you think that it is likewise absurd to say that it is indeterminate whether a single drive causes global warming; you might think that it cannot be indeterminate whether a single drive causes global warming because there clearly are other causes of global warming. However, if you think this, you are probably confusing causes with salient causes. Saying that a single drive causes global warming does not imply that this is the only cause. Nor does it imply that such a drive is a salient cause. You might also think that it is absurd to say that a single drive causes global warming (or that it is indeterminate whether this is so) since you think that the notion of causation is intimately connected to something like simple. Still, if you think so, it seems that you must accept strange conclusions in cases of pre-emption and overdetermination. For instance, if two shooters simultaneously shot me, and if both shots were sufficient to kill me, you would have to conclude that neither shooter caused my death. Second, you might be dissatisfied with the conclusion since you want to be able to say that a single leisure drive do cause global warming, and thereby draw the conclusion that there is a moral obligation not to go for a leisure drive. Still, even if we cannot determinately say that a single leisure drive causes global warming, Kingston & Sinnott-Armstrong are likewise wrong in claiming that a leisure drive definitely does not cause global warming (as well as climate change and their related harms). Therefore, they have not really succeeded in showing that there is no moral obligation to refrain from going for a leisure drive. We can at least say that it is undecided whether a single leisure drive causes global warming, climate change and their related harms. On this note, we might also speculate about what the harm principle would entail in cases where it is indeterminate whether I cause harm. One could specify it so it only entails that there is a moral obligation to refrain from performing some action when it is true that this action causes harm to someone. On this interpretation, the harm principle would not entail that there is a moral obligation to refrain from joyguzzling (at least not unless we have additional reasons for thinking that even minuscule emissions of greenhouse gases are large enough to count as causes of global warming). However, it does not seem farfetched to assume that we should specify the harm principle differently. We should rather specify it to state that that there is a moral obligation to refrain from performing acts when it is true that this act will cause harm, or when it is indeterminate that this act will cause harm. After all, it seems that we at least in some cases have moral obligations not to perform acts that might cause harm. As it stands, the harm principle seems false. It seems for instance that you would be justified in brusquely pushing someone aside even if doing so harms this person, if this would be necessary for saving a drowning child. The harm principle, however, implies that pushing someone aside would be a violation of a moral obligation. 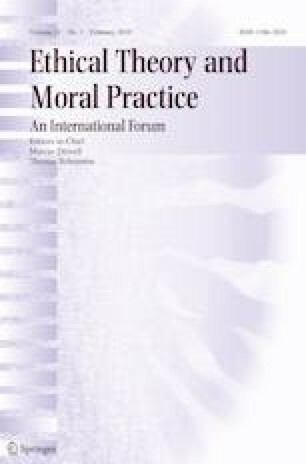 Hiller (2011) suggests that we should specify the harm principle to say that we have a pro tanto moral obligation not to perform an act that causes harm to others. This seems correct to me. Lewis (1973) argues that causation is the ancestral of counterfactual dependence, where counterfactual dependence is analysed along the lines of simple. I will explain what taking causation to be the ancestral of counterfactual dependence means later on in the paper. Jamieson elaborates his argument in Reason in a dark time (2014). On the topic of green virtue ethics in relation to Sinnott-Armstrong’s (2005) arguments, see also Hourdequin (2010) and (Sandler 2010). I must say, however, that I cannot see why a virtue theory necessarily would entail that I there is a moral obligation to refrain from going for a leisure drive. A proper phronimos – i.e. a person who appreciates what is morally relevant in the situation, who correctly weighs the different reasons in the light of how to best arrive at eudaimonia, and who acts in accordance with this – would certainly realise that if there is no causal connection between a leisure drive and global warming, considerations concerning global warming should not have any bearing on whether to go for a leisure dive or not. If the phronimos would refrain from going for a leisure drive, this must be because there are better ways for her to spend her time. (Kingston and Sinnott-Armstrong 2018, advances other considerations for why turning to virtue ethics does not solve this matter). For an elaboration of Kutz’s argument on this point, see Lawson (2013). For a critique, see Petersson (2013). The major argument of this paper is to a large extent an elaboration of an argument Petersson (2013) advances in response to Kutz (2000). Kingston & Sinnott-Armstrong use another terminology. For the most part, they use ‘climate change’ for an increase in the average temperature, and expressions such as ‘climate impacts’ to denote additional or more severe weather events (see also Kingston and Sinnott-Armstrong 2018, fn 3). I will stick to using the terminology suggested by Sinnott-Armstrong (2005). Petersson (2013) makes a similar argument in relation to Kutz’s (2000) account of complicity. On Kutz’s account, you might be complicit in E without having caused E. As his most important argument, Kutz claims that if we assume an individual difference principle (that you are accountable for a harm only if what you have done made a difference to that harm’s occurrence), you cannot be accountable for harm in cases of overdetermination since you did not make a difference to that harm’s occurrence. Kutz then concludes that you can be accountable for (complicit in) harm without having caused harm since we obviously can be accountable for overdetermined outcomes. Petersson points out that instead of giving up the causality requirement of accountability, we might elaborate our analysis of causation. Collective harm cases are cases where no individual act makes any difference for the occurrence of the outcome, but where there is a bad result when enough people perform some kind of act. For a thoroughgoing critique of Kagan’s (2011) argument, see Nefsky (2012). For a discussion, see e.g. Eggleston (2000); Gruzalski (1986); Jackson (1997); Parfit (1986); Petersson (2004); Shrader-Frechette (1987). The example is inaccurate historywise (cf. Suetonius 2003 ). For instance, had Brutus not agreed to stab Caesar, there would most likely have been no murder. Since Brutus was a direct male-line descendent of the man that overthrew the roman monarchy and established the republic, his participation was vital for giving political legitimacy to the enterprise. Still, if we consider the example as it is presented, Kingston & Sinnott-Armstrong’s point should be clear. They also suggest a few additional factors. These additional factors do not matter for the argument here. If you have trouble accepting this argument, see Petersson (2004, 2018) for a more expounded version of it. He proposes this argument first in relation to Parfit’s (1984) second mistake in moral mathematics (and the discussion that followed it), and second in relation to Feit’s (2015) suggestion that a plurality (i.e. an unstructured group) might cause harm. Simple would entail this given that we do not think that my death by being shot by two shots is an altogether different event than my death by being shot by one shot. This relates to Kagan’s (2011) mistaken argument that there must be a threshold in all collective harm cases. Unless I could affect governmental decisions or the decisions of a large company, and unless my single drive causes some great harm through a butterfly effect. I am grateful to two anonymous reviewers for pressing me on this matter. Note that the idea is not that we should think that a single drive causes global warming even though it in fact does not. Rather, the idea is that we might have reasons to consider global warming to be a fragile event, something which entails that a single drive do cause global warming. I am thankful to an anonymous reviewer for making elaborate this issue. Kingston and Sinnott-Armstrong (2018) suggest a partly different set of factors that might turn an overdetermining act (and therefore a non-cause) into a cause. Hart and Honoré use other notions when they describe this. They distinguish between causes and background conditions, where ‘causes’ denotes what I have called ‘salient causes’, and where ‘background conditions’ denote all conditions that are not (salient) causes. This was suggested to me by Dan Egonsson. If I would speculate about why it seems strange to say that Suzy’s throw contributed to the bottle shattering, I would say that even though it is true that Suzy’s throw contributed to the bottle shattering, saying so (instead of saying that Suzy’s throw caused the shattering) has the conversational implicature that Suzy’s throw was not a salient cause. Since Suzy’s throw clearly was the salient cause of the bottle shattering, it would therefore be misleading (but not false) to say that her throw contributed to the bottle shattering. For helpful discussion and/or feedback on earlier drafts of this paper, I am grateful to Henrik Andersson, Eric Brandstedt, Dan Egonsson, Anton Emilsson, Andrés Garcia, Frits Gåvertsson, Ivo Jacobs, Marta Johansson, Samuel Lee, Gloria Mähringer, Björn Petersson, Andreas Stephens, Signe Savén, Caroline Torpe Touborg, Jacob Green Werkmäster, two anonymous reviewers, the participants of the Higher Seminar in Practical Philosophy at Lund University, and the participants of the doctoral seminar at the Department of Philosophy, also at Lund University.